BEIJING - When he was elected to the country's top legislature in 2003, Professor Zhou Hongyu said he was a mere "student" who didn't know how to behave. But Zhou knew one thing for sure: He would start to push legislation much the way he pursues academic achievements - with passion, tenacity and innovation. Today, the 53-year-old from Huazhong Normal University in Hubei province has established himself as a top national lawmaker, known for advocating free compulsory education in China. "Passion is one of the most important traits of a scholar as well as a lawmaker," Zhou told China Daily. "In both realms, I want to do my best and get the most out of it." Before he landed his new job, Zhou had been a political adviser to the city government of Wuhan, the capital of Hubei, and had proposed making an education development plan for the city. In his field study at a school in a village in Xiaogan city in early 2003, Zhou saw a scene that pulled on his heartstrings: A block of sprawling houses fitted with broken desks and benches, and rows of students reading with their eyes almost pressed against the books because they could not afford electricity. The scenario reminded Zhou of the gloomy and bleak days when he was sent from Wuhan for "labor re-education" to a desolate rural area during the "cultural revolution" (1966-1976). He came to Beijing in March 2003 for the annual parliamentary session. When he found he did not stand a chance to speak to Wen Jiabao, then a vice-premier who joined a panel discussion with Zhou's delegation, Zhou ventured to tuck his proposal into Wen's hand, asking for free compulsory education for rural children. Zhou followed the action by submitting a motion to the legislature, urging the government to foot the bill for nine-year basic schooling in the countryside. According to China's constitution, a motion submitted by a deputy of the National People's Congress becomes legally binding when it is adopted. Zhou's proposal attracted a lot of public discussion in 2003, and two years later it became reality. "Many political advisers and lawmakers have made similar appeals before, but to no avail. Why? Because their proposals did not come up with 'why, how and when' - the tenable reasons, feasible measures and a roadmap for free compulsory education," said Zhou, who has had about 100 motions and proposals adopted. For each proposal, Zhou uses the Internet to solicit and share ideas with his constituents. 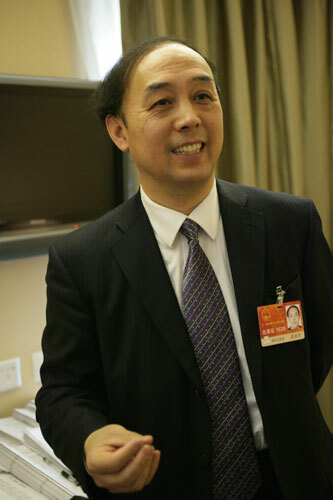 He created a website (www.hongyu-online.com) in late 2003, becoming the first national legislator in the country to use a personal website for legislative purposes. Both government officials and colleagues told Zhou that seeking free compulsory education was a lofty ideal, but not a realistic one. Yet Zhou refused to give up. Another reason that sustained his perseverance, Zhou said, was that he wanted to do his best, lest he let down his constituents. Members of the China Association for Promoting Democracy had given him great support, he said. Zhou is a member of the association, which is composed mainly of intellectuals. He calculated how much the government will need to spend each year if free education is implemented, specifically the amount for the years leading up to 2010. "I found that financially the country is well able to implement the free education program," Zhou said. In 2004, Zhou again sought legislation on free compulsory education for rural areas, emphasizing the feasibility and urgency of the move, which he said would promote social equity in education. In 2005, the proposal became a policy that benefited 30 million primary and junior high school students across the country, who had their tuition and book fees exempted. Those from poverty-stricken counties were also entitled to subsidies. In the ensuing years, Zhou continued his legislation "roadmap" for free education: first for the rural poor, then for the whole countryside, and finally compulsory education in cities as well. China now has nine-year free compulsory education throughout the country. In March 2008, when he began his second term as national legislator, Zhou published two books on how to be a legislator, especially on how to prepare and produce motions. "As a deputy of the National People's Congress, you can do many things that you couldn't have imagined when in the 'Ivory Tower'," he said. "The job, however, doesn't prevent me from becoming a professor of stature," said Zhou, an author of a dozen books on education studies.